Spines of all ages can benefit from chiropractic care. 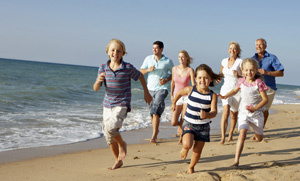 One of the key aspects of Burtis Chiropractic is our family approach to health and wellness. Just as we do not limit our practice to back problems, we do not limit our practice to any certain age group. Dr. Burtis has adjusted patients as young as minutes old, and senior citizens well into their 90’s. And it makes sense; why would you limit something with such a broad range of benefits to any one group? Infants and toddlers experience the benefit of a stronger immune system. This means chronic ear infections occur less often, and repeat upper respiratory infections just don’t have to happen. Treating infants with colic is one of Dr. Burtis’ special interests, and one in which he has years of experience. Children going through the pre-teen and teenage years find chiropractic especially useful. Whether it is the occasional injuries of playing around, or organized sports in high school or beyond, children experience both better performance and faster recovery from injuries. For young couples, another of Dr. Burtis’ especial areas of interest and experience is fertility issues. With Dr. Burtis’ help, since 1988 26 couples have been able to conceive and deliver healthy children where before they were childless. Senior citizens find Dr. Burtis’ gentle touch and expertise in multiple techniques a wonderful way to ease the challenges of aging with energy and exuberance. A deeper understanding of senior issues like arthritis, osteoporosis, and degenerative joint disease are key in offering gentle yet effective care for the golden years. And for every age group Dr. Burtis is qualified to offer nutritional counseling. With a Master’s Degree in Human Nutrition, Dr. Burtis is able to offer general nutrition advice as well as specific use of diet, supplements, and vitamins to assist your nervous system in bringing you back to health. Give us a call and let’s find out how we can help you or someone you know!